that sold for a whopping $2 back in 1927 (I found it in a friend’s used bookstore 8 or so years ago). The recipes in this book are, Â you guessed it, mostly of things that require refrigeration or freezing, but there are also a whole slew of menus that Miss Bradley just expects you to already have a reference for or have in another cookbook in your home. Not like you could just Google it back in ’27, though I can’t tell you how glad I am that we have that capability as I was really curious what in the world an “English Monkey with Crackers” (one of her After-Theater Lunches) might be. Turns out it’s the same thing as Welsh Rarebit, which she lists on a Family Supper Menu a few pages prior, so maybe Miss Bradley was just trying to keep things interesting. At any rate, Monday I made her Frozen Lobster Salad and paired it with Garlic Cheese Rolls. Far from the usual seafood salad we’d make with just mayo and veggies, this one used a bit of white sauce, gelatin, and whipped heavy cream in, in addition to mayonnaise. While it seems like an awful lot to do just for a seafood salad, and it’s only seasoned with salt and nutmeg, it was very tasty and, thanks to the gelatin, held up exceptionally well for leftovers. I’d probably add some diced celery or bell pepper to this to add some color and crunch, if I made it again. 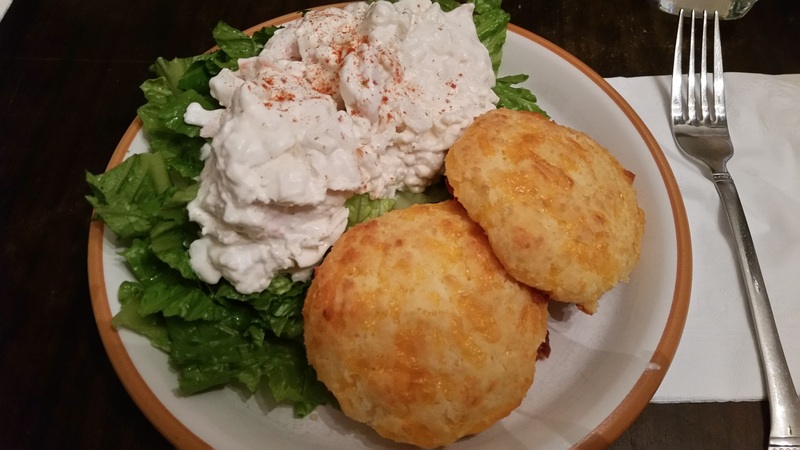 The biscuits were just the basic recipe from the box of gluten-free Bisquick (Bisquick was invented in 1930, apparently, so it’s not a complete anachronism to pair with the 1927 salad) with some garlic oil and a healthy dose of shredded Cheddar added. On Tuesday I used one of her dinner menus and just, as homemakers of her day would have, used the recipes or knowledge I had on hand. 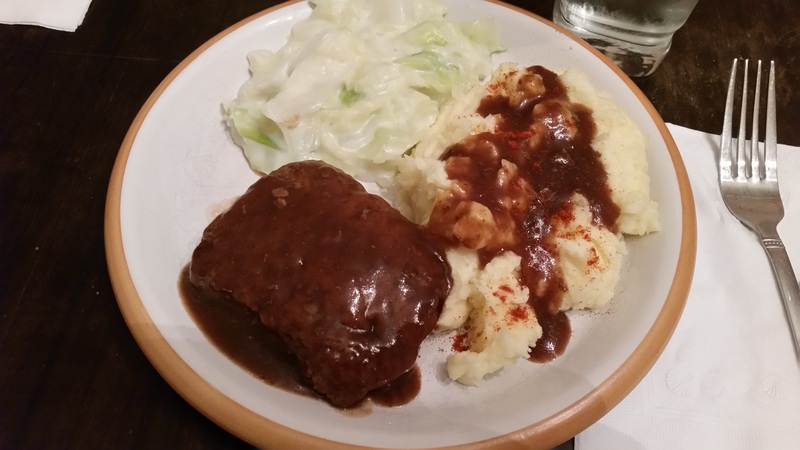 The Hamburg Steak was simply seasoned ground beef (salt, pepper, garlic oil, paprika, Worcestershire sauce) formed into rectangular patties and cooked on the stove. I made a gravy with beef base, a little red wine, and a cornstarch slurry after the first sides browned. The mashed potatoes were fairly basic mashed potatoes with butter and milk, and the creamed cabbage was boiled cabbage combined with a white sauce. Now, Todd and I are cabbage fans, but most of the year we eat it as coleslaw unless it’s New Year’s Day or St. Patrick’s Day, you know? We were both pleasantly surprised at how much we enjoyed the creamed cabbage, to the point that I could have eaten just that and been perfectly content for the night. It’s worth noting that, in making the very simple white sauce, I did add some chicken soup base for flavor, and I think that helped a lot. Creamed cabbage could well end up on our table again, though, thanks to this culinary trip through history. 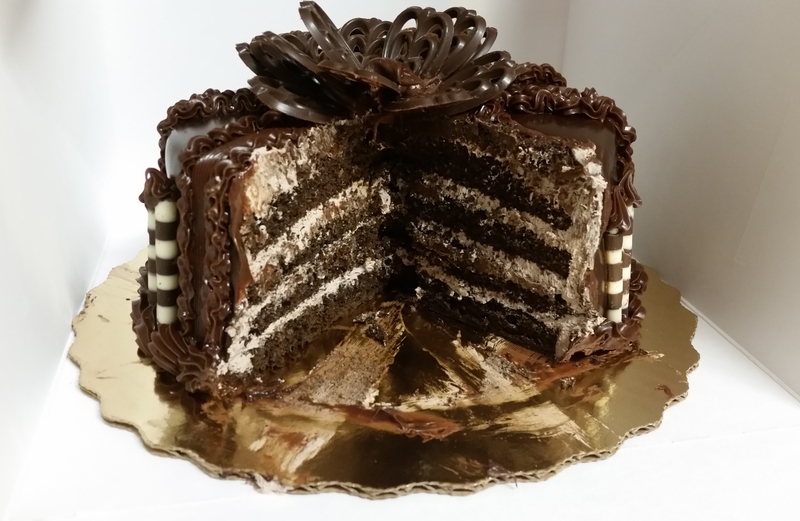 We already talked about Wednesday night, the night we had cake for dinner, and I still do not regret that decision one little bit. It was smart of me to put it mid-week, when the urge to cook is often weaker anyway, and it also helped that we were “ahead” on lunches so that we weren’t needing to get take out for lunch the next day, that sort of thing. 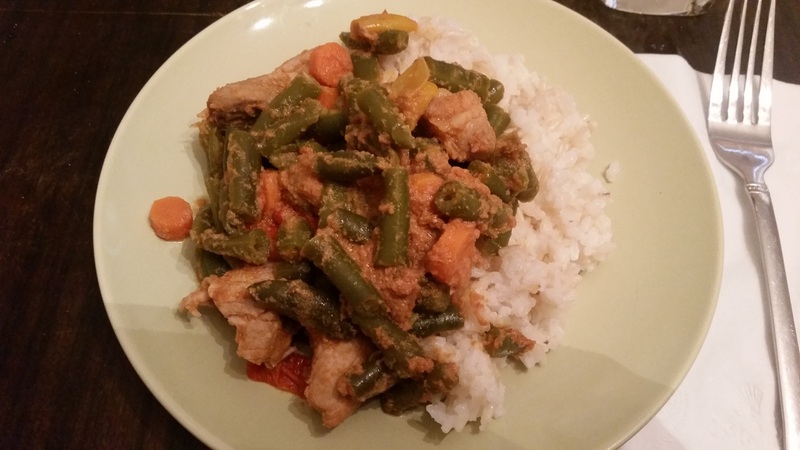 Thursday we returned to the present with one of our freezer meals: Pork and Veggies over rice. Instead of crocking it, I just put it on the stove to simmer while the rice cooked and that was plenty of time on the stove. While it’s not technically a stir fry, it’s similar enough that I thought some Yum-Yum sauce might go well on it (and I was right). On Friday we took advantage of some gift cards we had and went to Longhorn for dinner and have delicious calamari in a sweet chili sauce along with our steaks and potatoes. 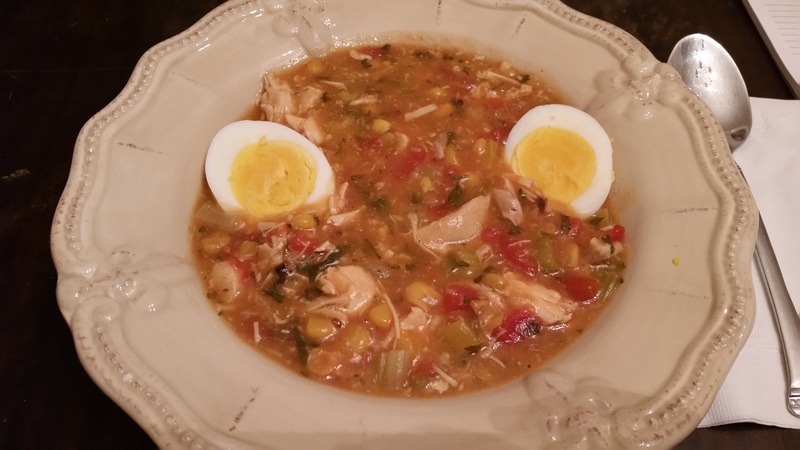 Finally, on Saturday, I decided to go back to the River Road Recipes cookbook, because I hadn’t made anything from the poultry chapter, and I made Brunswick Stew. I’ve never actually been a fan of Brunswick Stew, but Todd likes it and I thought it might be better if I made it to determine why I didn’t like it or, hopefully, that I’d like it better if it was homemade. After 2 hours and a bit it was done and I was so hot and tired from doing laundry that a thick chicken stew didn’t seem all that appealing, but I ended up enjoying it and Todd had two helpings (so I must have done something right!). Sunday was going to be breakfast for dinner, but we both had been grazing throughout the afternoon and just didn’t feel like an official meal. Since we had leftovers in the fridge we declared it a fend for yourself night, so there’s nothing really to show. I now have a decision to make, and that’s where to go for next week’s menu. Do I a) grab the reproduction of a Civil War-era cookbook I picked up at the St Augustine Fort a few years back or do I b) raid the 1973ish Betty Crocker recipe card collection sitting on my shelf. I mean, both are potential gold mines–what would you be more interested in seeing, hmm?